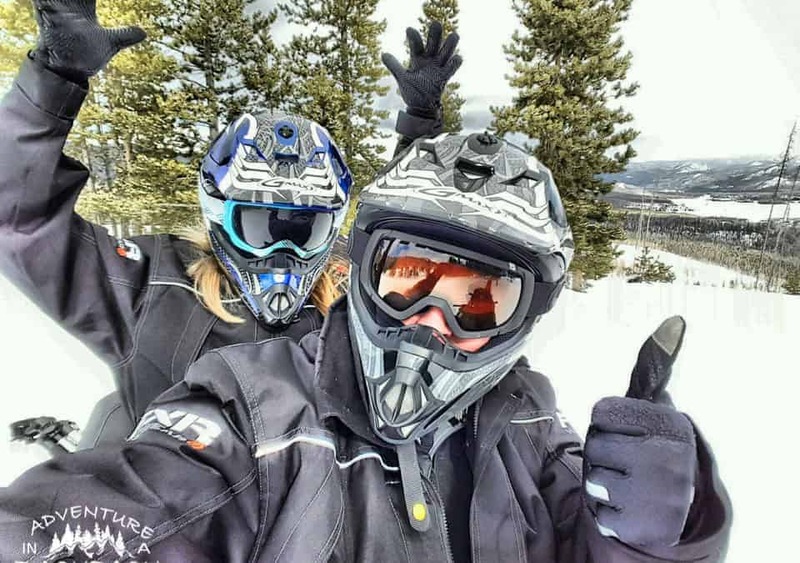 For our most recent adventure, we set out to go snowmobiling in Grand Lake, Colorado. What an adventure that was! 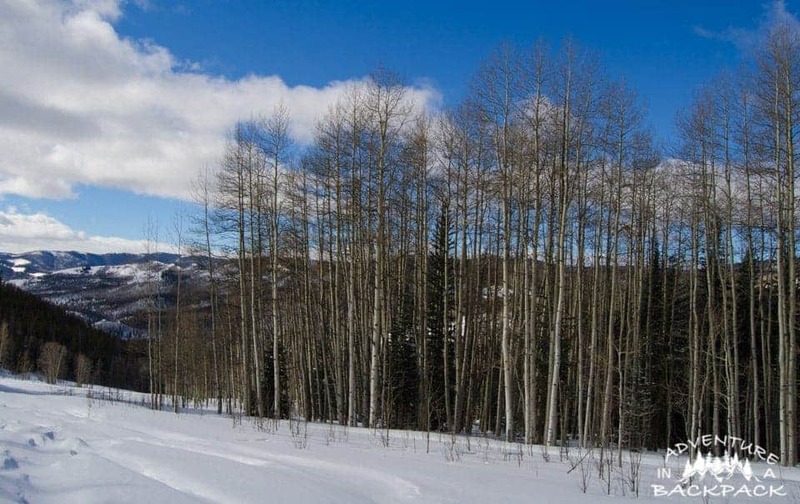 It was a gorgeous day for snowmobiling, as the weather was good and there was quite a bit of fresh snow on the ground. We started the day by heading to On the Trail in Grand Lake where we rented our snowmobile. They went over the trails with us and provided snowmobiling suits, boots, and helmets. The ladies at the front desk were great and they got us all set up to go out. When we were suited up and ready to go, the guys took us outside to show us around the snowmobile. Then we were off! We headed up into the trail system where they have markers and a map at each intersection. We also had our own map with us that the ladies at On the Trail had marked for us where to go and, more importantly, where NOT to go. So as we headed up the mountain, we knew where we were the entire time (okay, mostly). The first few minutes out were great, and we had no issues at all. Other than stopping a few times to snap some pictures of the mountains, we really just scooted on up until we got to an open meadow area. Once we reached this meadow, we got off the trail and played around in the snow a bit. It was a little tough to “play around” on that snowmobile though, because it was just so big and not really maneuverable. After a quick stop to shoot some video and grab a snack, we headed back up to the trail. As I just mentioned, the snowmobile we were on did not handle well. It was big and heavy and it had a hard time, well, being a snowmobile… It didn't turn well even on the trail, and we had a hard time getting it up over 25mph just because it wouldn't grip the snow to turn. Not really all that thrilling for a couple of adventurers, but you live and you learn! Next time we will be sure to get two separate sport bikes that are lighter. I wish they had told us that! Back at On the Trail before we set out, the guys who showed us around the snowmobile showed us how to get it unstuck if we found ourselves in that situation. I remember very vividly how sure they were that “any two people can get this snowmobile unstuck from anywhere.” Oh, they've never met us and seen just HOW stuck we can get something! We followed their guidelines to get it unstuck and that did little more than get us even more stuck. We tried for about an hour and a half before realizing that the two of us alone were not getting that thing out. It was STUCK. Now, here was the part that really irked me. As soon as we got stuck, the first thing I did was check my phone to ensure we had signal in case we couldn't get out of the mess we were in. I not only had 3 bars of signal, but I had 3 bars of 4G signal. Facebook let me know that I had signal by sending a few messages to me. So no worries there. Until we actually decided that we needed to call On the Trail to have them come help us out. My phone was still registering the 3 bars of 4G signal, however, my phone would not dial out AT ALL. Nate's would make “Emergency Calls Only.” At this point, I panicked. We were about 2 hours from sunset, and I didn't know how we were getting out of there with no signal. I still do not understand how that happened. AT&T, you really messed up there! We ended up making the emergency call to 911 and let them know what was going on but that it was not an emergency… yet. They contacted On the Trail for us. At that point, we ditched the snowmobile and headed up the mountain to try to get to the trail. We could hear some other snowmobiles and were hoping they were heading towards us. By the time we got up to the trail, we saw them… four glorious snowmobilers on the trail. We finally caught their attention and they headed down to help us out. They headed down to the snowmobile and after some discussion in a language I couldn't identify at the time, they worked out a plan to get it out. The four of them plus Nate were able to muscle it out after a couple attempts (no, I did not help, as I could barely stand up at that point I was so exhausted). Now, these were no ordinary four guys on snowmobiles. These were four Icelandic men who had come to Colorado to go snowmobiling in Grand Lake for a few days. This was a dad and his two sons and one “adopted” son who own and run an ATV Guide Company in Iceland. Of all of the people we could have run across, we managed to get help by the owners of 4×4 Adventures of Iceland. They are adventure seekers as well, and they were so great to talk with. I wish we had been able to take them out for dinner and drinks, but they were heading back to Denver to fly out that night. However, we did promise them that we would come visit them in Iceland sometime, so we will see them again! And if you are ever in Iceland, go on an ATV adventure and call up 4×4 Adventures of Iceland! After we were rescued, we headed back down to the base at On the Trail. We were about an hour and a half late getting pack, but On the Trail did not charge us any extra. They were extremely helpful and completely understood our situation. Overall, they treated us really well and we can't wait to go back and rent TWO SEPARATE snowmobiles. 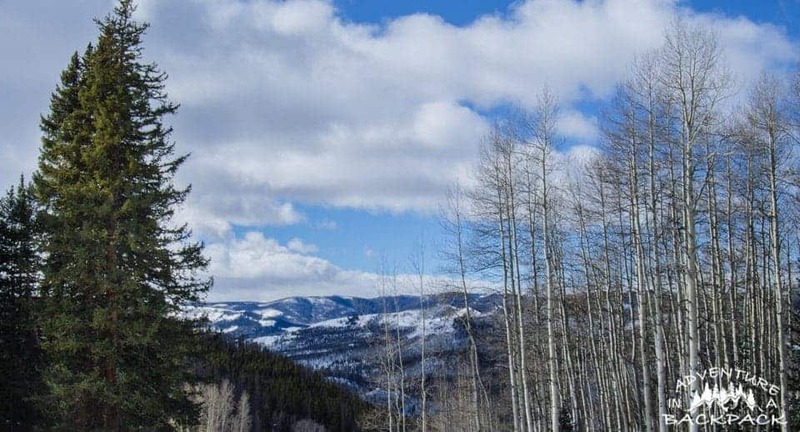 If you ever decide to go snowmobiling in Grand Lake, check out On the Trail! Even with the little fiasco we had, it was still a great time. And hey, at least now we have a good story to tell! Once I got calmed back down and got some food in me, I realized it was definitely not as bad as it felt at the time. It's always easier looking back and laughing once you are in the comfort of a restaurant with a cocktail in hand! And honestly, if we hadn't had that hiccup in our day, we never would have met the guys from 4×4 Adventures. Now we have a contact in Iceland, so there's the silver lining to our story! Check out our Facebook page and “like” it to see more updates and more pictures from our snowmobiling adventure, and subscribe to our page for all of our updates! We got some great shots today that will also be for sale in our Landscape Photography for Sale Page. Till next time, happy adventures! The best adventures can start with a misadventure. Plus new friends are always a plus! Rescued by Vikings! Doesn’t get cooler than that! Add a trip to Iceland to my bucket list. Great story. Isn’t that cool? We are definitely going to be taking a trip to Iceland! And you’re always invited! All good adventure stories have some mishaps. A good reason to visit Iceland haha. Nice!